DO YOU FIND CHEWING TO BE CALMING AND RELAXING OR HAVE A CHILD THAT IS BITING AND FIDGETING ALL THE TIME? 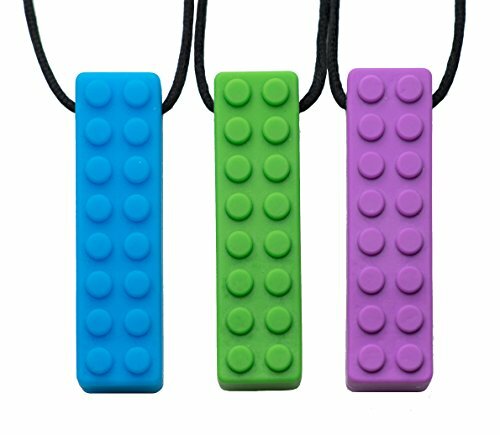 THEN OUR SENSORY LEGO BLOCK CHEW NECKLACE SET IS PERFECT FOR YOU! HEAVY DUTY AND TOUGH – Our Chewlery Pendants are made from strong materials, that are durable, but yet soft so they are pleasant to chew. Ideal toys for a teething infant, toddler or baby. If you have any questions about this product by Chew Chew, contact us by completing and submitting the form below. If you are looking for a specif part number, please include it with your message. Borbona Body Sock - Medium 47" x 27" - Blue - Profits Go to Charity - Sensory Sack for Kids with Sensory Needs and Autism - Perfect Sensory Tool to Help Children Relax!